My Wey of Life: It's Charity Time! You must be wondering why I didn't blog these few days! "She must be feeling lazy!" "WHAT THE???" Must be in your head now. Why is she designing Christmas cards for?? Well, the story goes like this... few days ago, I was flipping the newspaper and saw the charity ad. That reminds me of the past.. I remembered when I was in Malaysia, my sister will always buy a whole lot of groceries and some stationaries during Chinese New Year and donate it to the orphans. I remembered she will always look really happy and fulfilled after donating to the orphans because she knows the orphans will be happy to have yummy food to eat and new things to use. Until I came to Perth, I get to know about volunteering job available. I went online and do some research and found Cancer Council WA that needs some volunteers. I sign up online, fill up the forms and drove out the find the place. Unfortunately, because I was quite new here in Perth, not knowing the road, I got lost and accidentally missed a traffic light and got myself my first ever traffic fine, in Perth. Yes! Today is finally here! 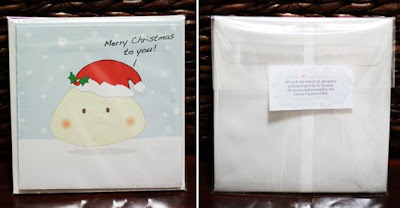 I went through the process of sourcing the paper, envelopes and done whole heap of research for my first ever Christmas cards! I'm selling them online here in my blog and all profits will go to the charity. In a packet, there are 4 cards in different designs, 14 x 14 square card and envelopes included. 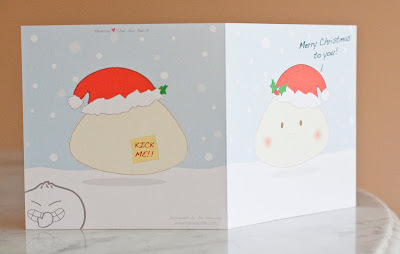 All designs are originally created by me~ The card is all about Mantou and Char Siu Bao in Christmas with a little humor. 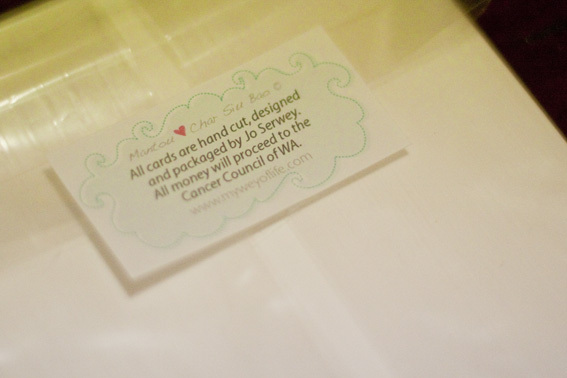 All cards is design front and back, and the whole story will tell if you open the card up. 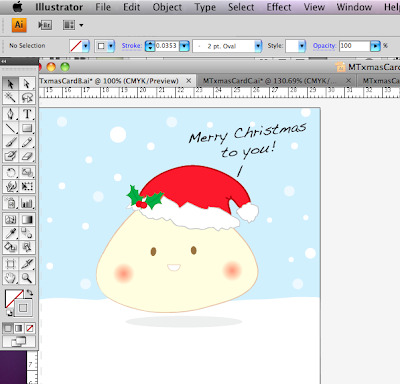 Go to the Charity Cards-Mantou button on the top bar and click it! 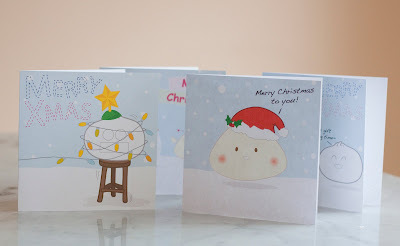 It will bring you to my selling cards page so you can see the card design. REMEMBER to click on the BUY NOW button! can i be in the cards as well? I want to be siu long pao! hahaha! but siu long pao ~ hahahahaha NO PROBLEM!